A 2 1/2-week break in December due to injury might have been just what Jonathan Cheechoo needed to get his season on track. Cheechoo will try to build on his first hat trick of the season on Tuesday night when his San Jose Sharks host the Calgary Flames. Cheechoo led the league with 56 goals in 2005-06, but slumped to 37 last season. He had just four goals in 28 games in 2007-08 before missing seven with a groin injury. He's rebounded with 10 goals in 20 games since returning on Dec. 26. Cheechoo had three goals and an assist in Saturday's 4-3 win over Nashville. The hat trick was the ninth of his career and first since April 1. "I've been feeling good since about Christmas time," Cheechoo said. "I've been working hard, and the puck has just been bouncing my way. The game winner was the memorable one. You want to help your team out like that, so when you get to do that, it makes it more special." With the win, the Sharks (31-17-7) improved to 3-1-0 on their season-high six-game homestand. San Jose is 17-5-3 at HP Pavilion and has won five of six there. Joe Thornton chipped in three assists versus the Predators, giving him 17 in his last 14 games. The top overall pick in the 1997 draft needs one assist for 500 in his career. "I'm really happy for Cheech that he scored a hat trick," said Milan Michalek, who recorded San Jose's other goal. "Our line didn't play well last game, so I'm happy we stepped it up and scored a few goals." Coach Ron Wilson, meanwhile, became the 11th coach in NHL history to earn his 500th win. "It's a special milestone for coach to reach 500," Cheechoo said. "It's pretty amazing and it's nice to be a part of that." The Sharks are 8-1-1 with two ties in their last 12 home games against the Flames (28-20-8), but have dropped the last two meetings overall, both last month. 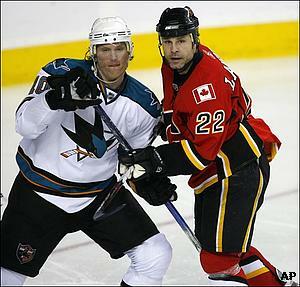 Cheechoo scored in the third period of San Jose's 5-4 loss in Calgary on Jan. 30. Owen Nolan, who played for San Jose from 1995-2003, recorded his first hat trick since Oct. 4, 1999 in that contest. In 16 previous games against the Sharks, however, he had posted just one goal and three assists. Nolan scored twice in Saturday's 4-1 win over Edmonton. Calgary seemed inspired by three fights in the opening six minutes. "It got everybody into it and it shows the type of emotion our team can play with," Nolan said. "There's no limitations if we play that way." The Flames, who are tied with Nashville for seventh place in the Western Conference, are opening a five-game road trip all against Pacific Division opponents. "If you don't get points night after night, you are not moving up. If you aren't getting points, you aren't keeping up," Calgary defenseman Dion Phaneuf told the Flames' official Web site. "This road trip is huge for our team to get points in a tight division in a tight conference." Calgary has lost three of its last four on the road and is 13-10-1 there this season.